Richard & B.A. Ryan (1958) Ltd. This beautiful and functional building represents more than just a combination of needed municipal buildings. The buildings reflect what can be accomplished when the people of Oakville, their Town Council, together with a group of Boards, Commissions and Committees blend their thoughts and ambitions into a common concept, on one parcel of land, with a singular architect and contractor. This is an achievement of which all citizens of Oakville can be justly proud; an achievement which is a fitting Centennial Year accomplishment. The architectural firm of Dunlop, Wardell, Matsui, Aitken of Oakville and Toronto were retained to design and complete this Project. 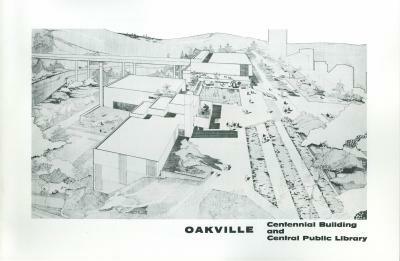 Mr. George Farrow, Oakville architect of that firm, was chosen as the supervising architect and partner-in-charge. The construction firm of Richard & B. A. Ryan (1958) Ltd., of Toronto, Ontario, were awarded the construction contract for the building. Mr. George Buckingham of that Company was Project Engineer. Situated on a spacious 3.5 acre site in the heart of downtown Oakville, the buildings have been skillfully blended into the historic hillside of the 16 Mile Creek valley. The site was originally known as the Central School Common. The Centennial Building complex will eventually contain four major sections. At present the Central Library, the Centennial Gallery and the Centennial swimming pool are housed and connected on the one site. Beautifully landscaped Centennial Gardens set the building in a most attractive and charming motif. To be constructed at some future date will be the Main Auditorium. THE CENTRAL LIBRARY contains three major floor areas. The Upper Floor, which is gained from street level, contains the adult library, referenee library, music and fine arts room, work and staff rooms. The Middle Floor is devoted to the Children's Section of the library. Here you will find a complete children's section and a story-hour room complete with stage. Staff and work rooms, along with storage areas, complete this floor. The Lower Floor has an entrance access from the parking area to the rear or river side of the building. The technical library section is located on this floor. The remainder of this floor is work space and storage area for the total library. THE CENTENNIAL GALLERY. This attractive and spacious gallery room was specifically designed to accommodate works of art of all media, educational exhibits, industrial exhibits and civic functions. THE CENTENNIAL SWIMMING POOL. The pool building is located immediately adjacent to the Centennial Building and is currently under construction. When completed in February of 1968 the building will house a 25-metre year-round swimming pool. Attractive and functional dressing rooms, lobby and visitors gallery will add to the enjoyment of those using these facilities. -Official Opening, December 9, 1967. -Cost of all buildings, including architect's fees, landscaping, furnishings, parking areas - $1,307,510. -Area of site, 3.5 acres. -Architects: Dunlop, Wardell, Matsui, Aitken of Oakville and Toronto. -General contractor: Richard & B. A. Ryan (1958) Limited, Toronto, Ontario. -landscape architect: Donald Hancock, B.S.A., Hornby, Ontario. The Oakville Centennial Gallery and the Oakville Public library belong to all the people of this community who are interested in sharing life's experiences and ideas. Who are these people? The delightful child whose eyes sparkle with the discovery of nonsense verse . . . The young man intent upon exploring space development . . . The senior citizen re-reading Dickens . . . The mystery fan with good-natured requests for the latest one . . . The business man anxious to keep up to date . . . The art student discovering the beauty of the ages . . . The stamp collector comparing collections . . . The veteran fascinated with the perspective of history . . . The avid reader eager to know more in every subject . . .
All of the resources of the Gallery and library - sculpture, paintings, films, records, magazines, books - are available. It is hoped that they will not only provide pleasure and information for all Oakville citizens, but that they will stimulate new ideas and make it possible to learn all that man has ever thought or understood.